For smaller boutique agencies, it can be difficult to grab the attention of bigger brands and get to work with the likes of Coca-Cola and PepsiCo. Hero Group, a small New York shop, wanted to find a way to help itself and others its size score big clients, so it formed the Hero Collective, a carefully selected group of agencies from different disciplines. "We think the agency model of the future is a collection of small ones who have varied skill sets that can work collaboratively without necessarily adhering to some of the bureaucracy that governs quarterly economic earning targets that somewhat stifle creativity and objectivity when it comes to bringing the best ideas forward," Hero Group CEO Joseph Anthony said. Hero Collective is an extension of the agency's desire to help smaller boutique shops get some major attention and "dispel stereotypes about size really mattering in marketing anymore," Anthony said. "Big agencies don't have a monopoly on big ideas." 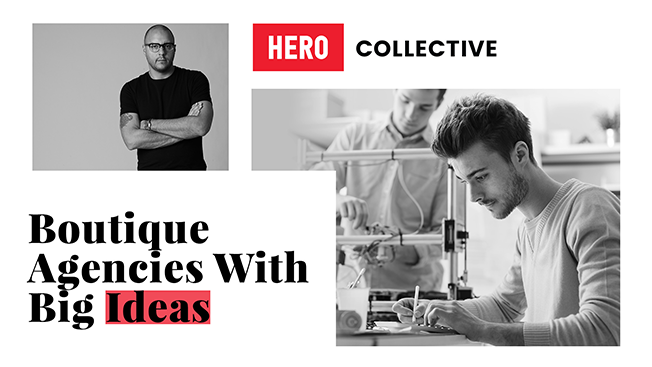 With that idea in mind, Hero Collective was born. At its core the collective is a network of boutique agencies and startups vetted by Hero Group. The hope is it will take some of the work on the part of brands out of searching for reliable, smaller shops. "If we can do some of that heavy lifting and use the credibility that we are creating, then it helps drive the economy and drive innovation at the small-business level where it typically begins," Anthony said. Hero Group was also behind last year's "#ChallengeMeBrad" campaign, which called on PepsiCo brand manager Brad Jakeman to work with smaller shops. After Jakeman expressed frustrations about working with larger shops at last year's Masters of Marketing conference, Hero Group went public with the campaign. Hero Group decided to keep Hero Collective small initially, with roughly a dozen agencies including virtual-reality production house Wemersive and media company Frank 151. While the collective has not started working with big brands yet, Hero Group has started introducing the idea to some of its larger clients like Pfizer and received positive feedback so far.